It contains twelve times more vitamin C than a fresh orange. The ingredient is loved by luxury cosmetic brands and known as the elixir of youth. What is it? I would like you to meet a substance that I love thanks to my grandma. Seriously. She revealed the secrets of natural beauty care and introduced me to the most effective vegetable oils. Among them, there is one that belongs to the group of the hottest oils worldwide. As the name suggests, sea buckthorn oil is extracted from sea buckthorn – a popular plant of a characteristic orange fruit. Fancy a fun fact? Sea buckthorn is sometimes called a Siberian pineapple. What’s the secret of its huge popularity in beauty care? Most of all, sea buckthorn oil is a rich ingredient. I was shocked by a number of nutrients – for our skin and hair – it conceals. Cold-pressed and (!) unrefined sea buckthorn oil abounds in vitamin C. Delivering this vitamin is the easiest way of enjoying a beautiful skin. Moreover, the oil offers a complex of vitamin A + B + E that effectively slows down the first signs of ageing. You think that’s it? Sea buckthorn oil is the source of amino acids, folic acid, flavonoids, minerals e.g. calcium, potassium, phosphor… There is an endless number of valuable ingredients the oil includes. No wonder it has settled in many women’s daily beauty care. Mine too. I adore using the product for hair (especially mixed with other oils and extracts, Natura Siberica Oblepikha), face, body and nail care (without additives). 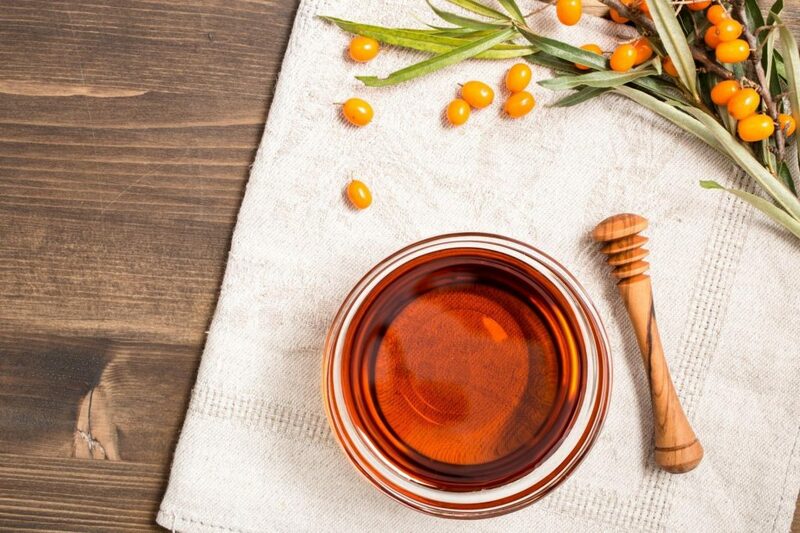 What are the effects of using natural sea buckthorn oil regularly? supports getting rid of old scars, stretch marks and fine lines.